Hi Be Different Act Normal readers! I'm Sarah and my little blog is This Crazy Blessed Life! I started my blog about 4 months ago and it has been a blast so far! Blogging and crafting is totally my stress relief and creative outlet and I've already *met* some awesome Blog BFFs in the process! I blog about sewing (like this little beauty for my beauty), cooking and meal planning (like my yummy chicken alfredo pizzas), being a mommy (like my post about keeping my babies little), crafting and lots more! I'm sharing my my popular post thus far with you today! I have been browsing stores looking for some inspiration for pillows for my bed to go with my new quilt I'm making. (It's almost done! I'm onto the quilting step!) I went into a party store to get some goodies for Gray's upcoming birthday and there was a Pier 1 next door. I'm so glad I went in! They had lots of awesome pillows, but this is the one that caught my eye. I knew that I wanted to do this pillow in white to match my new bedding. 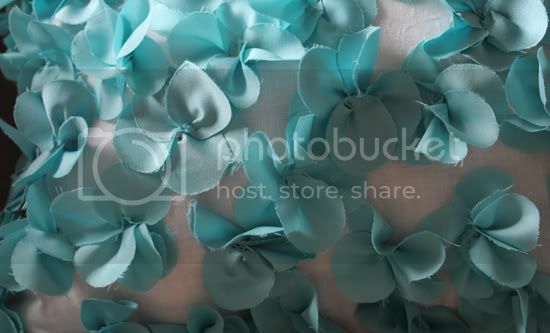 But on Friday, while hemming my Pool Blue bridesmaid dress, I had the bright idea to do blue flowers. My walls in my bedroom are a muted turquoise color, so the extra 6 inches of fabric I cut off my dress would be perfect to use! Start off by cutting out your pillow fabric to your desired size leaving room for your seams. If you are stuffing with another pillow, sew three of the four sides leaving the 4th side open to insert the pillow. If you are stuffing with stuffing (think I could say stuffing one more time? ), sew three sides. On the last side, leave a small hole (3-4" long) to add the pillow filling. On the fabric that you are using for the flowers, find a small circle to trace. I used a medicine cup ( 1" to 1.5"). Fold the fabric into quarters and trace the circles on the top. In hindsight, I wish my circles & flowers were bigger so I had to do less of them. Hold or pin the fabric together and cut out the circles. You'll be cutting four at a time. 1. Fold circle in half and about 1/16" from the bottom, stitch through. 2. Then come back through the one side of the circle. Your thread should be in between the two pieces. 2. Repeat with 3 more circles. 3. For the last circle, fold in half and stitch through. Come back through the one side of the circle. Adjust the final petal and stitch through the flower to hold petals in place. Finished product! Stitch these flowers randomly onto the pillow. It seems obvious, but make sure to only stitch through the top layer of fabric and not both layers. Once the pillow is full, insert pillow stuffing. Fold the edges under and pin the front and back together. Stitch the insides together by only sewing the insides of the folds. If you do this, your hand stitching is invisible! And voila! A finished pillow! And my cost = $0! Everything was on hand for this project! Stop by and visit This Crazy Blessed Life! I love new Blog BFFS :) Thanks so much to Lorie for this opportunity!